Nose: Rich aromas of vanilla, sweet toffee and lots of ripe fruits - apples and gooseberries in particular. Notes of fruit blossom and wild-flower meadow arrive, with subtle tones of citrus and a hint of oak in the back. Very enjoyable. Palate: A smooth start of creamy sweetness with lots of vanilla and lingering toffee, immediately complemented by a massive load of warm spices - oak, nutmeg, white pepper, cloves and a delicate touch of cinnamon. Pleasant flavours of star fruit, luscious oranges and peaches arrive with a gentle touch of floral notes towards the finish. Amazingly delicious. Finish: The finish is long and sweet with creamy toffee and lingering vanilla. Subtle prickling oak leads to a warm and velvety mouthfeel with a hint of citrus on the tail. With water: Water tames a bit of the floral character of this dram on the nose, while vanilla and citrus fruit come to the fore. Very creamy and thick on the palate with custard, toffee and warm spices of oak, nutmeg and cinnamon. The finish is still long and warm with a sweet touch of toffee and vanilla, and a hint of prickling oak on the tail. Extremely delicate. 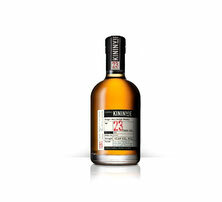 Comments: This third official release under the Kininvie name is a lovely dessert dram. The combination of bourbon and sherry casks along with the 23 year maturation generates a wonderful balanced malt with lots of depth and richness. Dried fruit, zesty orange, flower meadow and quite a hot mix of spices compose this luxurious whisky, which definitely has a fair amount of American oak maturation. Thankfully the Grant family chose to release this lovely nectar from their tiny distillery. I thank Markus Heinze (Brand Ambassador for Glenfiddich in Germany) for the sample and Campari Deutschland GmbH for the photograph!